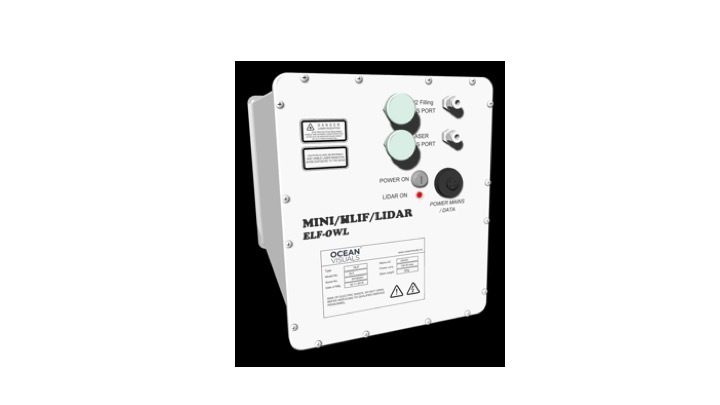 ELF OWL™ is the worlds most compact Hyper-spectral Laser Induced Fluorescence LiDAR sensor. It has been specially design with footprint and weight in mind. Measuring 25x30x45 cm and weighing only 22 kg, the ELF OWL™ has the same detection capacity as a SEA OWL™ system. We designed the ELF OWL™ with aerial operations in mind, particularly coastal monitoring from the air, but also for ocean monitoring. We designed the ELF OWL™ system based on the analysis of the technical requirements needed for operations over water. The construction of the sensing laser (a customized model of the excimer laser with 308 nm emission) was redesigned for weight minimization and lower electromagnetic interference (EMI) to other electronics equipment onboard of a UAV. The optical layout of the ELF-OWL™ was optimized to increase the light aperture by applying the multi-module telescope with fiber cable output coupled with hyper-spectral detector. New detector schematics was implemented to get more intelligence and functionality. End-user software interface adaptations to include (near) real-time drone location and data visualizations. AIR OWL™ (Oil-in-Water Locator) is a Hyper-spectral Laser Induced Fluorescence (HLIF) LiDAR (Light Detection and Ranging) for airborne remote detection, identification and quantification of oil spill in water measured from a fixed wing aircraft. The principal layout of AIR OWL™ consists of modules providing sensing from the air into the water with a laser pulse and the spectral detection of the echo-signal with following analysis. An Onboard Mission Management System (MMS) is not a part of AIR OWL™ but serves as an external operator console integrating the basic control of the AIR OWL™ and data reception and visualization. The MMS sends the commands and receive the observation data layer for the full picture. The AIR OWL™ display data in a map that adds qualitative and quantitative information on oil pollution for real-time observation and decision making. A laser is responsible for releasing powerful UV light pulses in regulated time slots. The Hyper-spectral detector consists of an optical telescope, a spectral unit (polychromator), and a multi-channel optical detector (MOD). The detector serves for collecting Laser Induced Fluorescence (LIF) light flux from a distant water surface, to disperse that light into linear spectrum, convert that spectral distributed light into multi-channel electrical signal with the aid of a gated intensified multichannel detector, perform digital readout of each of the channel value and record these spectral data. The resulting spectrum serves as an input for identification and calculation of the spatial distribution of pollution. A Real Time Controller (RTC) is responsible for proper handling of simultaneous and time critical events. There are more essential functions incorporated in RTC that simplifies the overall operation of the HLIF sensor. An Onboard Control and Command Server (OCCS) serves for evaluating organic pollution distribution, quantity, alarms, maintaining HLIF GIS database, providing organic pollution distribution map layer in real time for the MMS. A Space & Time Awareness Module (STAM) serves for binding each spectrum to GIS database, making it possible to locate each spectrum/sample/alarm on the map and in the timeline. Ocean Visuals AS is a Norwegian company providing sensor systems for early detection of oil and organics in water.